Whether you’re looking to build your next big application, learn some really cool technology concepts or gain some hands-on development experience, Google Cloud Platform (GCP) is a great development platform. But where do you start? Lots of customers talk to us about their varying application development needs — for example, what are the best tools to use for web and mobile app development, how do I scale my application back-end and how do I add data processing and intelligence to my application? In this blog, we’ll share some resources to help you identify which products are best suited to your development goals. Cloud Functions is another great event-driven serverless compute platform you can use to build microservices at the functions level, scale to infinite size and pay only for what you use. If you’re looking for a lightweight compute platform to run your code in response to user actions, analytics, authentication events or for telemetry data collection, real-time processing and analysis, Cloud Functions has everything you need to be agile and productive. Developer tools provide plugins to build, deploy and debug code using your favorite IDEs, such as IntelliJ, Eclipse, Gradle and Maven. You can use either cloud SDK or a browser-based command line to build your apps. Cloud Source Repositories that come as a part of developer tools let you host private Git repos and organize the associated code. Below are a sampling of resources, check out the developer tools section for more. BigQuery offers a fast, highly scalable, low cost and fully managed data warehouse on which you can perform analytics. Cloud Pub/Sub allows you to ingest event streams from anywhere, at any scale, for simple, reliable, real-time stream analytics. BigQuery and Pub/Sub work seamlessly with services like Cloud Machine Learning Engine to help you add an intelligence layer to your application. Google Stackdriver provides powerful monitoring, logging and diagnostics. It equips you with insight into the health, performance and availability of cloud-powered applications, enabling you to find and fix issues faster. It’s natively integrated with GCP, other cloud providers and popular open source packages. 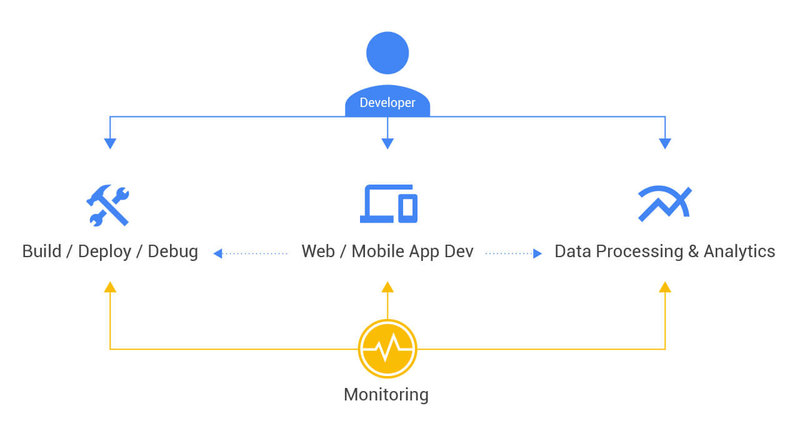 I hope this gives you enough content to keep you engaged and provide great learning experiences of the different application development services on GCP. Looking for tips and tricks as you’re building your applications? Check out this link for details. Sign up for your free trial today and get a $300 GCP credit!